This is a ridiculously tasty salad! Nice and crunchy, with the freshness of the apple and sweetness of the raisins. 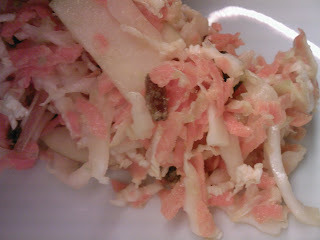 Try this and you will not be disappointed (unless you really don't like cabbage, or carrots....or apple). Put the vegetables, raisins and apple in a large bowl and mix well. In a bowl, mix the mayonaise and mustard. Pour this dressing on top of the vegetables and mix.